Marc Von Em is a soulfully energized singer and musician whose sound flows easily between blues, folk & funk. Driven by his fluid acoustic guitar playing, rich powerful voice, and comfortable, sincere stage presence, Marc's live shows never fall to excite audiences. Marc began his solo career in 1999 when he self produced and released his first solo original recording entitled "Von Em". The album was well received by critics & fans alike and created quite a buzz on the New York City music scene. Living in NY's Hudson Valley, Marc was in perfect proximity to many great music venues. 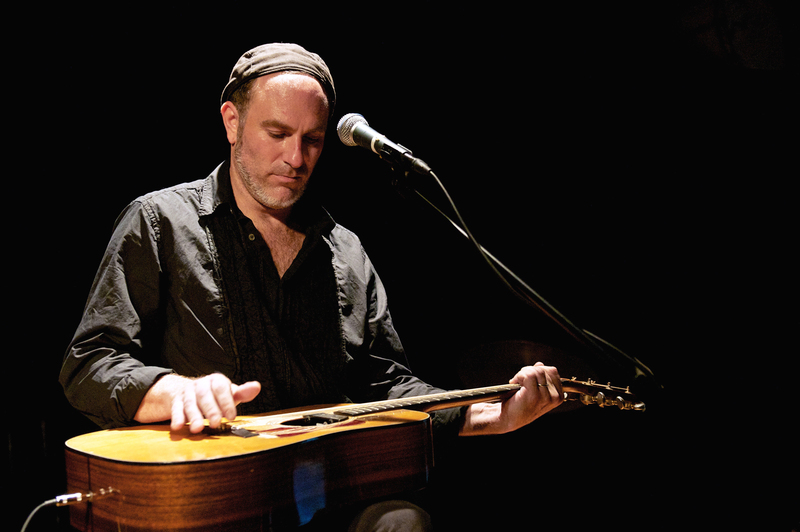 He began to deliver his brand of music from Massachusetts to Virginia, appearing at well know venues including The Living Room, Rockwood Music Hall, Club Passim, Cafe Lena, The Iron Horse Music Hall, The Tin angle and more. Marc shared the stage with well know national acts such as Martin Sexton, Lucy Kaplansky, Glenn Tilbrook, Charlie Musselwhite, Debbie Davies... the list goes on. One of Marc's CD's ended up in the hands of NYC's jingle house McHale Barone, and Marc began to expand his career into the commercial industry by singing and co-producing "This Bud's for You" for Budweiser's 2000-2002 TV & radio ad campaign. This initial venture into the commercial industry became a crucial part of Marc's career, opening doors that have helped him to his current success in the industry today. Marc released his second studio recording entitled "Free" in 2002. Mixed by Crit Harmon (Martin Sexton, Catie Curtis, Mary Gauthier), this album captures Marc's strong, sincere voice and lyrically rich song writing. His unique finger picking & guitar style round out this album beautifully. "Marc is one of a new breed of urban folk musicians who, with detailed, thoughtful songwriting and gritty delivery, are redefining the singer-songwriter genre of the 21st century". — Crit Harmon In early 2005, Marc's career took and unexpected turn when he was asked to be part of the Rob Thomas (Matchbox 20) Band. Circling the globe as a backing vocalist and guitarist, Marc also appeared with Rob on all the major TV shows from the Today show to the Tonight Show. He performed at "Fashion Rocks" in Radio City Music Hall, and was honored to perform for over a million people at Live 8 in Philadelphia. His live energy and songwriting won him opening slots for several Rob Thomas shows, playing to packed houses. "...I asked Marc to open up a 10,000 seat gig for me, just him and his guitar, he killed it!" — Rob Thomas Marc came off the tour in 2006 with a collection of new original songs, and immediately resumed playing theaters and clubs from New York to Seattle. The Rockwood Music Hall in NYC became a regular stop for Marc's solo show, and it's where he recorded his third release, and first live CD "Live From Rockwood Music Hall". Released in 2007, this recording, without question, captures the essence of Marc's live solo show. Soulful, funky, sometimes bluesy, always sincere. As one reviewer writer "I can genuinely say if you haven't heard or seen him live, you're only cheating yourself". In 2009 Marc joined Rob Thomas for a second tour. In addition to contributing even more of his vocal and guitar talents to the show, Marc was happy to oblige when asked to open for Rob once again. While touring with Rob, Marc began writing songs for his now completed fourth release "Crash BoomPow", he proudly believes this recording is his best to date. A testament to his belief that an artist not be limited to one genre "Crash Boom Pow" is a diverse yet coherent collection of 10 original tracks. From classical solo acoustic performance to full band funk, this recording runs the gamut of styles while Marc's unmistakable voice and stellar guitar playing form a cohesive glue that bonds the music together. On "CBP" Marc explores new instrumentation and production, adding horns, keyboard, violins and guest vocalists to several selections. In 2014, Marc signed with Pure Pop Music, a music publishing company representing writers in various genres of popular music. Through Pure Pop, he has been spending time in Nashville co-writing songs with some of Music Cities best writers. He is also signed to VAMNation Entertainment as a vocalist on high-profile, globally broadcast commercials, and to HAUS Music contributing his musical talents to reality TV shows, soundtracks and commercial uses. At the end of 2016 Marc came off of a third tour with Rob Thomas, having collectively spent 2 years on the road traveling across the US, Canada & Australia. Simultaneously he continued his solo career, writing original music and selling out solo shows. Also during this time much of Marc's instrumental music found a home on the soundtrack for the cable show "American Pickers". In Spring of 2017 Marc will be heading out on a month long tour, performing his original solo music at venues throughout the Southeast.